A stromboli is a type of turnover filled with meat, cheese and/or vegetables. 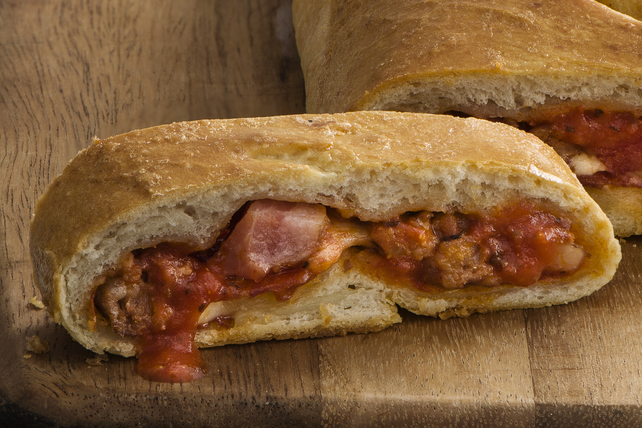 Our Meat-Lover's Stromboli is filled with Italian sausage, pancetta, pepperoni, CRACKER BARREL Mozzarella and CLASSICO Traditional Pizza Sauce. Serve this delicious recipe as part of your next game-night menu with friends. Remove casings from sausage, if necessary. Crumble sausage into small nonstick skillet; cook on medium heat 5 min. or until sausage is evenly browned, stirring frequently. Drain sausage; spoon into medium bowl. Add pancetta to skillet; cook 3 min. or until crisp, stirring frequently. Drain pancetta; add to bowl with the sausage. Roll pizza dough into 15x10-inch rectangle on lightly floured surface; spread with pizza sauce to within 1/2 inch of edges. Top with mozzarella, sausage mixture and pepperoni. Moisten edges of dough with water. Starting at one long side, fold 1/3 of the dough over filling; repeat with other long side. Firmly pinch ends of dough together to seal. Place, seam side down, on parchment-covered baking sheet. Use kitchen shears to cut 3 diagonal slits in top of dough; brush with egg. Bake 20 to 25 min. or until golden brown. Cool 5 min. before transferring stromboli to cutting board. Cut into 10 slices to serve. Substitute 3 bacon slices, cut into 1/2-inch pieces, for the pancetta, increasing the cooking time for the bacon just until bacon is crisp, stirring frequently.